Sun Rival is a charming weeping crab apple tree. Ideal for a small garden as it will only ever reach a final height of around 2.5m. Heights are rough estimates as Mother Nature does not adhere to EU regulations or British Standards which state goods must be as high as we say they will be! She is one of the few entities that can tell the EU to go forth and procreate and get away with it. In spring, this tree is covered with extremely pretty pink buds which turn into white flowers. Later in the season, bright-red fruits are formed. Autumnal colours include yellow leaves. Of major interest is that this tree is disease resistant, so need for environmentally unfriendly insecticides or fungicides. Malus Sun Rival has characteristics outstanding enough to be awards the RHS AGM (Award of Garden Merit). This means people who profess to know what they are talking about get together and vote to see which are the best plants and trees of each category. There is no red carpet ceremony as far as we know. It most likely takes place in a shed or greenhouse and is more a collection of flat caps, wellies and ginger biscuits than champagne and celebrities. Considered to be clay tolerant which means it will not complain in writing or start a petition if you plant in clay but arguably could form a sit in protest. Plant in good draining soil for best results. Will benefit from an occasional thinning to promote new growth and exhibits interesting and varied colours throughout the year which consist of orange, reds/purple and yellow. Malus Sun Rival is considered self-fertile which means you do not require another apple tree nearby to pollinate the tree and crab apples to develop. If your Sun Rival does not produce crab apple trees then someone has stolen them, the birds or squirrels had them, all the blossom was blown off in a hurricane in Spring or you planted the wrong tree. We are THAT confident that Malus Sun Rival is a self-fertile tree and WILL produce crab apples. 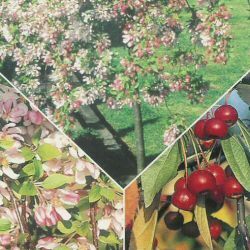 Should we be out of stock of Malus Sun Rival then Malus Royal Beauty is a similar weeping crab apple tree although the Royal Beauty is considered suitable for planting in public parks. This is usually down to particularly aesthetically pleasing qualities, requires low maintenance or other such characteristics not found in the Sun Rival. Hardy down to minus 20 degree centigrade which for the purists out there is a rating of H6. This tree is supplied at of height of between 1.25 and 1.75 metres in a 12 litre container, which means that the tree can be planted any time of the year and with better results than either bare-root or rootballed trees. Although suitable for container growing, it is not considered a variety that lends itself to it readily and you will need to pay attention to feeding and watering.